Ramatuelle Swim shorts Baleine. At first glance you would think it's a basic boxer, stylish and chic with a tone on tone stripe effect created by the use of special treated yarns! The fabric used however is a so called "seersucker". Read more.. This technical fabric has been developed especially for clothes worn in a tropical climate. This light weight fabric has the special feature that because of the 3 dimensional texture , it will float above your skin, leaving the fresh air circulate, so you will never feel sticky! Really fantastic!!!! Great comfort! Swim shorts for all ages! Always in style! Available in a bright royal blue, and a dark navy blue, but always with the fluor orange Ramatuelle contrast details, like the piping at the side seam and back, the drawstring and the fluor orange logo embroidery. These shorts have two pockets at the side seam and a small inner pocket. The mesh inner brief has a soft elastic around the leg opening. 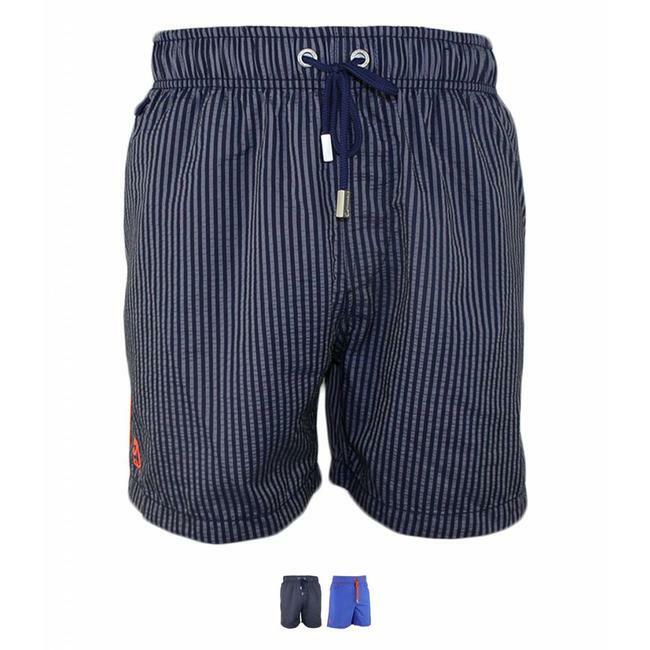 Swim shorts Baleine are available from Boyssize 1-2 to size 11-12. Ramatuelle Swim shorts Baleine. At first glance you would th..